Seoul has not yet set a timeline on a visit by Kim Jong-un but remains open to the possibility. The significance of a possible visit to Seoul by the North Korean leader lies in laying the foundations for the second US-North Korea summit, rather than with its timing, President Moon Jae-in said Tuesday. Speaking after his meeting with Prime Minister Jacinda Ardern of New Zealand in Auckland, Moon said the timing of Kim’s visit was secondary to its purpose. “Rather than whether or not Chairman Kim Jong-un’s visit is within the year, the more important thing is to make the visit instrumental in expediting and achieving bigger progress in North Korea’s denuclearization,” Moon said, saying he still believes it possible for Kim to visit Seoul within the year. During Moon’s visit to Pyongyang in September, the two Koreas agreed to arrange a visit to Seoul for Kim within the year. However, doubt has been cast on the plans with little progress being made in US-North Korea talks. Moon went on to say that if Kim’s visit takes place, the most important task is to “expedite, mediate and persuade” the North to speed up the denuclearization process at the second US-North Korea summit. The timing of a second summit between Kim and US President Donald Trump has yet to be finalized, but the US leader has stated on a number of occasions that the meeting could take place early next year. “Chairman Kim Jong-un’s visit would be the first by a North Korean leader since the division,” Moon said. On the matter of South Korea-New Zealand relations, Moon and Ardern agreed to strengthen cooperation in a wide range of fields. 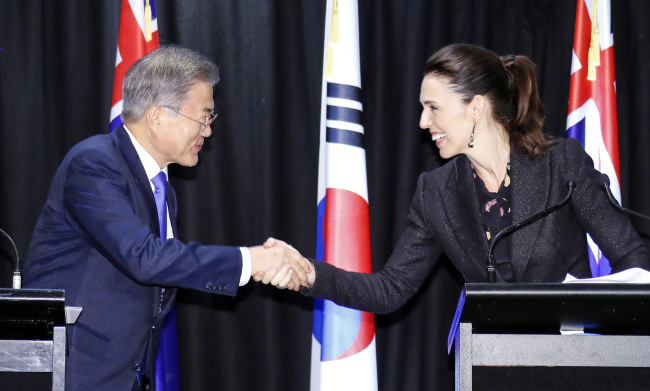 The New Zealand prime minister also expressed support for Moon’s efforts to establish peace on the Korean Peninsula and reaffirmed her country’s commitment to nuclear nonproliferation. “New Zealand’s stance on nuclear nonproliferation is clear and it is our hope that 2019 will see further progress towards achieving denuclearization of North Korea in a complete, verifiable and irreversible manner and an enduring peace on the Korean Peninsula,” she said at the joint press conference after the summit meeting. According to Seoul’s presidential office, the leaders agreed to strengthen ties through Korea’s New Southern Policy and New Zealand’s Pacific Reset policy, which aims to consolidate and expand the country’s presence in the Pacific and ties with Pacific island nations. At the press conference, Moon said the two sides had agreed to seek closer cooperation in the agricultural and construction industries, as well as the defense industry. The two countries will also seek closer cooperation on Antarctic research as well as in the fields of health care, ICT and biotechnology.